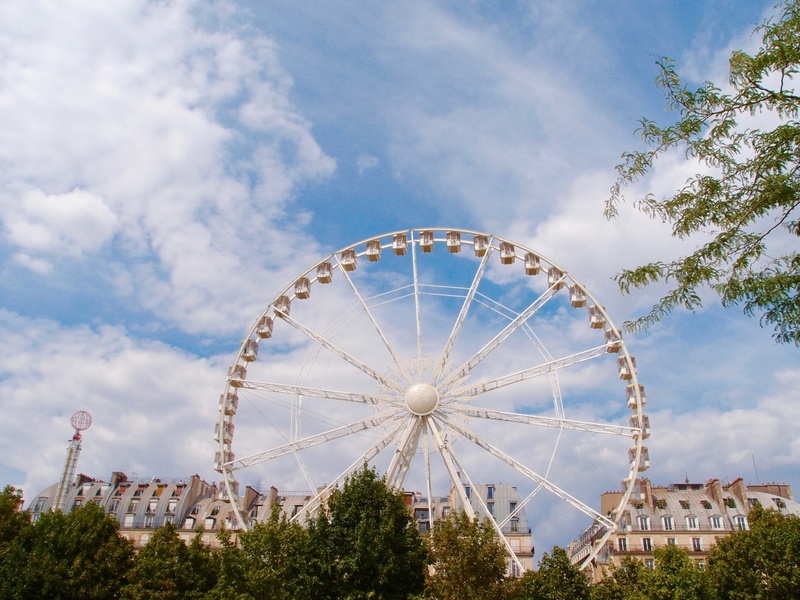 During my family’s recent vacation in Paris we did a lot of sightseeing and everything lived up to the expected splendor – the Louvre, the Eiffel Tower, Versailles – but it was the smaller pleasures that made me love Paris. Paris, how do I love thee? Let me count 6 ways. Crepes on the street! Can you believe that they make the most delicious crepes right on the street? During a long day of sight seeing we were hungry and lost because we missed our bus stop. As we stepped off the bus and pulled out a (Google) map to figure our location, there was a crepe stall right in front of us. Refueled with delicious crepes and re-oriented, we were ready to tackle the rest of our day. Every lost encounter should be so sweet! 2. Hot chocolate at Angelina. 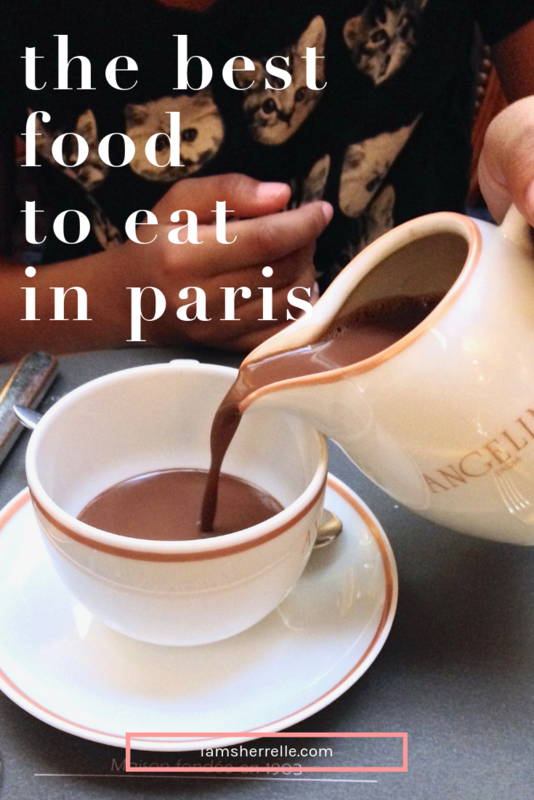 While in Paris you must go to Angelina for hot chocolate! If you look on the website you will see that they have one at Versailles and one in the Louvre, but they are small. Go to the one on rue de Rivoli; it is beautiful. The food is expensive, but good; the croque monsieur comes highly recommended and my husband loved it. You can also just order a hot chocolate and pastry. 4. The buildings are works of art. I was an art major in college and while I loved most of my art history classes, the lectures on architecture always put me to sleep. A dark lecture hall and static slides about 18th century churches?—Time for a nap! But now I know that it wasn’t architecture that put me to sleep, it was the slides! Walking around Paris I LOVED the architecture! On almost every block I was like a wide-eyed kid pointing, “What’s that building?” “Oooo, I love that building!” Just walking around outside was like being in an art museum. I started taking photos of all the beautiful doors that I saw on our daily walks around Paris. How lucky the French are to live in such a beauty city! 3. Courtyards, squares and gardens. Paris is big city with all the usual big city ways: large buildings, crowded streets and fast cars. But in the midst of the city chaos are beautiful pockets of calm. Walking around the streets of Paris, just when we were tired or lost (did I mention that we were often lost?) and needed to regroup, bam!-there was a garden, square or courtyard with greenery, flowers and chairs. The gardens and squares were filled with people talking to friends, reading a book or eating lunch. As busy as Parisians are, they also make time to relax and recharge. This mixture of energy and chillaxing is another thing that I love about Paris. 5. Surprises around the corner. Paris has so many tiny streets and some of them are only a block long. It’s so easy to get lost! It’s also easy to turn down a street and see something fantastic, like a perfect still life of a bike and red store front on a cobblestone pedestrian street. So delightful! 6. Île Saint-Louis. This is one of two natural island in the Seine river (the other is Île de la Cité, the larger of the two and home of Notre-Dame). My husband and I fell in love with this beautiful, tiny, romantic island. It is primarily residential, but there are several boutiques, shops and restaurants on rue Saint-Louis en L’Île. My children will return for the ice cream at the famous French glacier Berthillon (the Salted Caramel is the best ice cream that I have EVER tasted), but my husband and I will return to Île Saint-Louis just to wander around in it’s beauty. There’s a nice hotel and a few romantic restaurants that we noted. We shall return without the children. *Of course there are more than 6 reasons to love Paris! Read about one of my favorite neighborhoods in Paris here. Thanks for taking us with you at least in our minds! Looks like you all had a blast!